I watched a programme a couple of years ago about two chefs trying to set up restaurants in Manchester that would achieve Michelin stars. One was taking over a hotel restaurant and going down a fairly traditional route. The other was trying for a brand new, modern, slightly out-there approach. The latter spent ages training their waiting staff to have a faux-casual attitude while still maintaining fine-dining standards. You know, "Hi guys, I really want to tell you about how we sourced this beef from a real local cow." But it came across as a bit false, not like the staff actually cared. 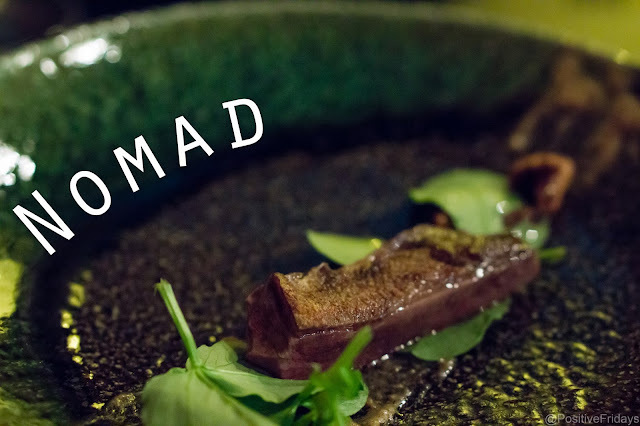 Well, Nomad seem to have the relaxed fine dining service nailed. I've been to Nomad on various occasions and now they finally have their own space at BOM Labs. Edd and I got ourselves booked in sharpish. 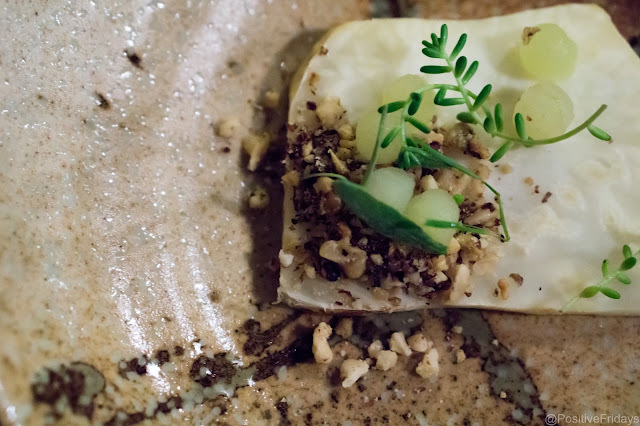 We were there on a Saturday evening, when the menu is nine courses of varying sizes for £50. We also added the matched drinks for £25 extra. 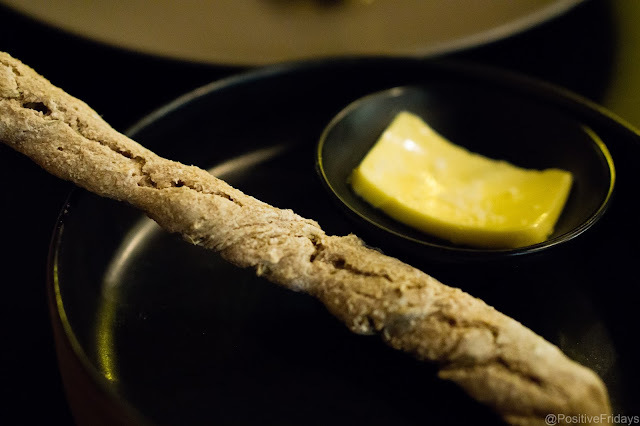 Naturally there was bread and butter to start. Next up, a carrot to share. This caused some laughs of course but it was a marvellously delicious carrot, cooked for hours so it was soft and fragrant. The double mussels were nicely presented on a stack of mussel shells. There was a salty finish and just a hint of the sloe berries which had been used. Our first drink was an English sparkling wine which is apparently the Queen's favourite wine. Good work Queenie- it's delicious! Fresh and tasting of apples, I'll be hunting it down! The next course was salt baked celeriac with little apple spheres. 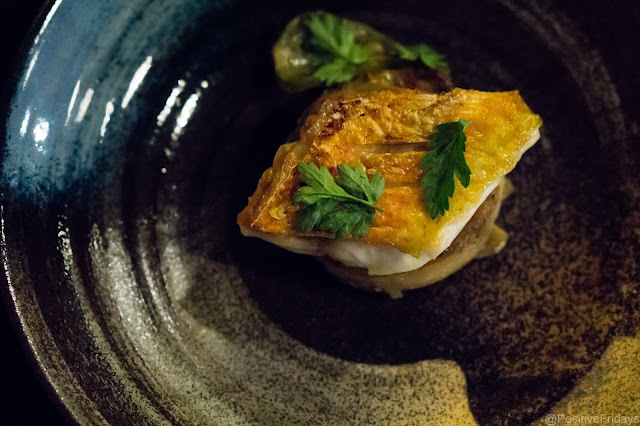 This was an earthy dish. I found the celeriac a little dry and wished there was more apple. 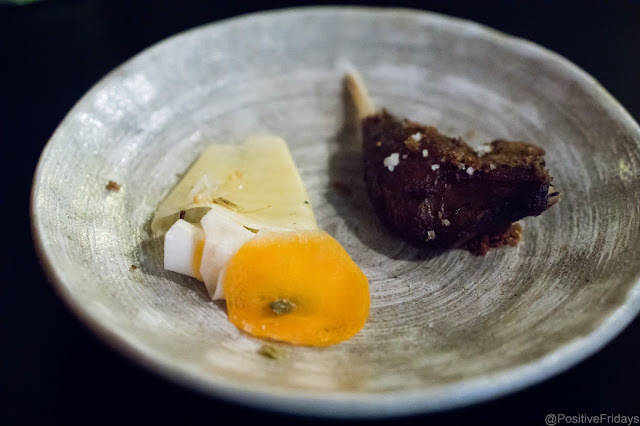 The first meat dish was a mallard (duck) 'lollipop' with pickled turnips and carrots. This was a surprising dish with Asian-inspired flavours in the duck and the juniper pickled vegetables working perfectly alongside it. At this point we had moved onto a delicious chilled red wine. I always thought I didn't like red wine but places like Nomad keep surprising me with light and fresh wines which don't make me feel heavy and sluggish afterwards. 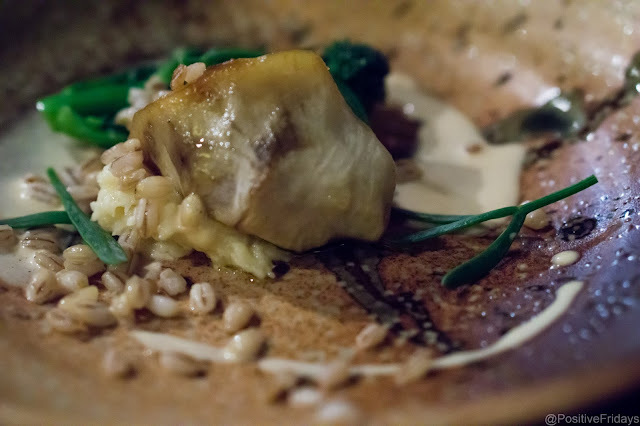 Our next course was Jerusalem Artichoke with a smoky garlic cream, broccoli and toasted pearl barley. I love that Nomad aren't focused on meat, they use whatever is most appropriate. This was a warming, autumnal dish. Cornish red mullet was perfectly cooked with crispy skin, served with ramson and nori potatoes. There are so many things on that description that I'd never heard of before. Ramson is wild garlic, a relative of chives apparently. It was more delicate than garlic but worked wonders on my head cold. 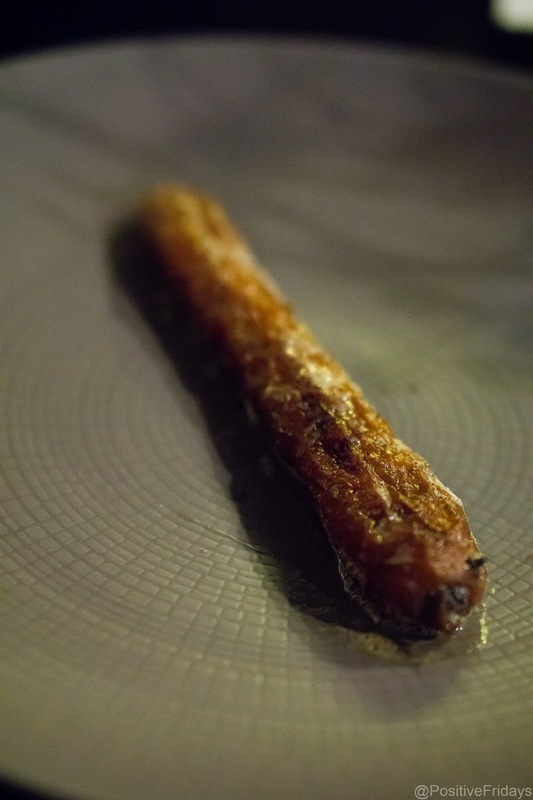 The nori potatoes are thin slices of potato cooked in stock and then compressed, like a less rich dauphinoise. More mallard. Again, I love that they've used the same meat twice on the menu because that's what available. Who says you have to stick to fish and two different types of red meat? 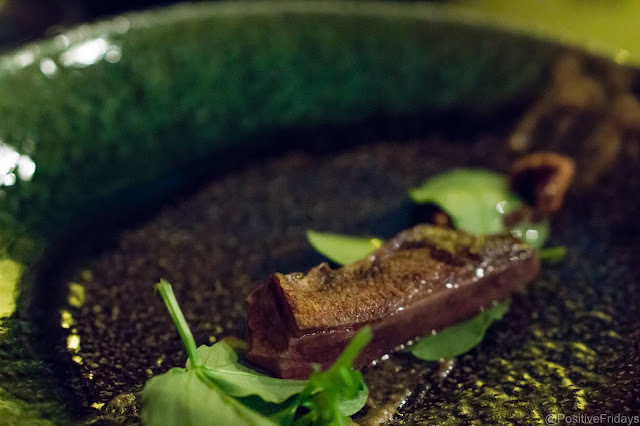 The mallard was wonderful and came with something called hedgehog mushrooms, so called because they're kind of spiky looking.The mushrooms were the star of this dish and a great discovery. Onto puddings. of which there were three. First up, rum and raisin parfait with tea infused raisin puree. This was such fun. The taste of rum and raisin ice cream with the melty sophistication of a parfait. The next dish was one of my favourites. Poached pair was served with cloud-like almond sponge and an absolute revelation to me- cream flavoured with melliot. 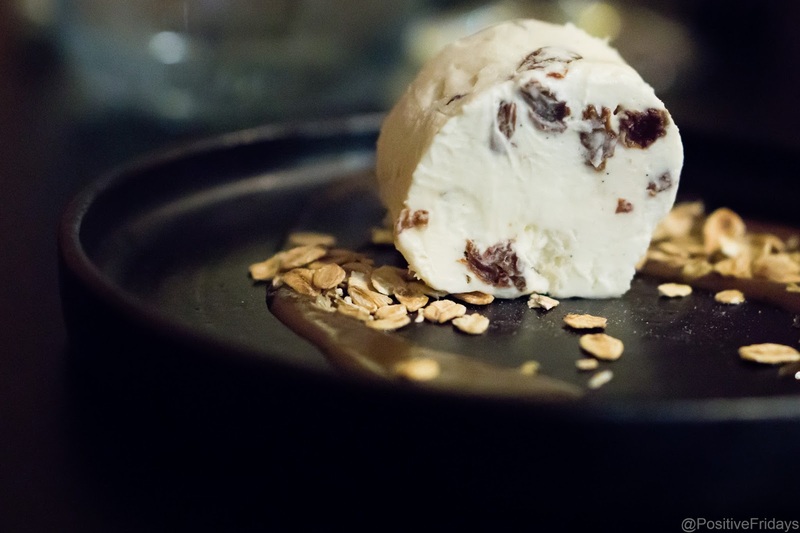 So, Nomad use local alternatives wherever possible, so instead of using imported vanilla, they used a flower called melliot, which has a similar taste to vanilla but more floral. I loved it. This whole dish was amazing and I didn't want it to end. I'd had a fair amount of wine at this point and was typing ridiculous things like 'a summer day in a meadow' into my notes. But I was right, pretentious or not. 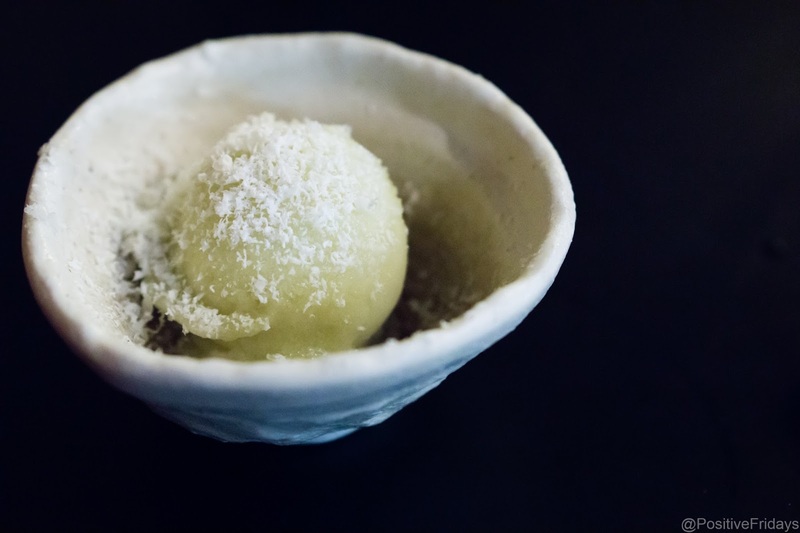 The final dish was a lovely little cleansing scoop of apple and douglas fir sorbet, sprinkled with frozen goats cheese. The small amount of goats cheese was perfect. 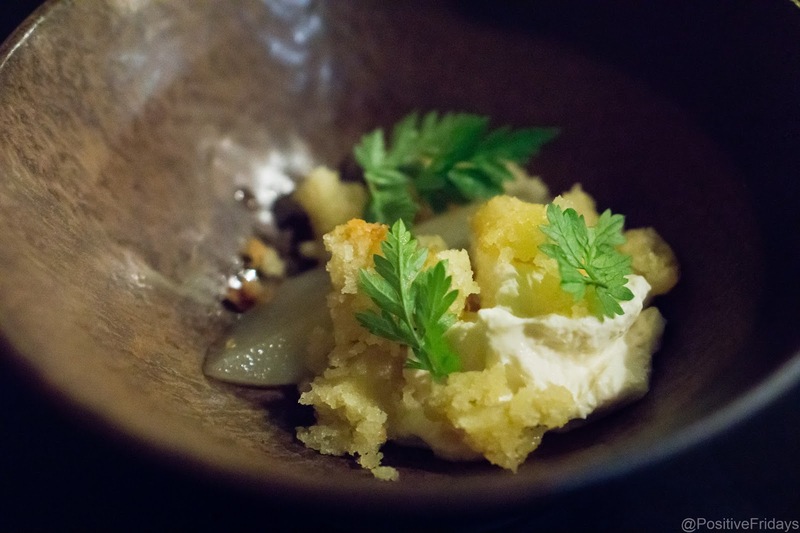 As always, the food at Nomad was exciting and unusual. I tried new things, found new favourites and Edd and I had plenty to chat about. Service was relaxed but informative. The matched drinks were genius- English sparkling, chilled red wine, a Japanese beer, a richer red wine to go with the mallard and finally a syrupy dessert wine which tasted of raisins. It's definitely worth doing. 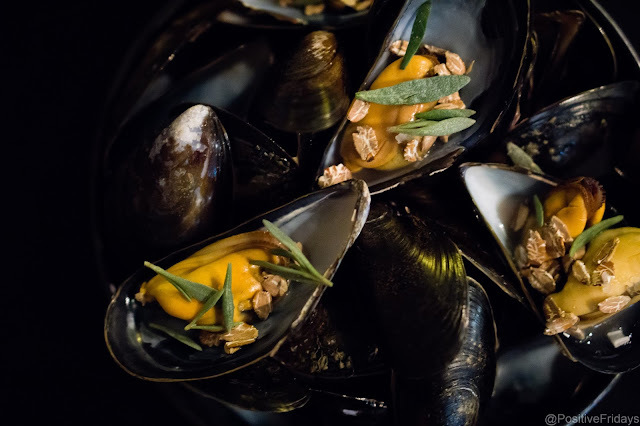 The food is imaginative, thoughtful and makes you feel good. I didn't feel sleepy and stuffed afterwards, I felt satisfied but also able to skip away to a party! We paid for our meal and drinks matching but they did kindly send us a couple of free douglas fir martinis on arrival. They are amazing, you should try them.